It may have been some time ago, but although you’re now a parent, you can probably still think back to your teenage years and remember your first breakup. One moment, you were on cloud nine. The next, you’ve crashed and shattered to pieces. The breakup may have caused you the most intense emotional pain you’ve ever felt before. Or, it may have overwhelmed you with disappointment, crushing your joy and making you feel downhearted, tearful, and helpless. The pain and feelings of loss a breakup often brings with it can cause symptoms of grief, including denial, anger, and depression. And those things can even affect the person who initiated the breakup. Clearly, the end of a relationship can be a very difficult experience for any teen. How can they learn to cope with the heartbreak, pain, and disappointment? As their parent, you can actually be a great source of strength, guidance, and support for your teen during this difficult time. While you may think your child probably doesn’t want you to interfere if you know what to do and what not, they won’t necessarily feel like you’re forcing your help on them. 1. Remember, it’s not your breakup! Good or bad—no matter what feelings you had toward your teen’s former boyfriend or girlfriend, try to keep them out of the equation as much as possible. This isn’t about how you feel—it’s about how your teen feels. So, keep the focus where it belongs! In fact, initially, it may be best if you don’t say anything and simply let your teen do the talking. Granted, perhaps they don’t necessarily feel like spilling their feelings to you. But you can always encourage them to confide in someone else they feel comfortable with. The bottom line is, they need to get their feelings out, not hold them in. However, caution your teen about letting their frustration and pain out publicly. Yes, they need to let it out, but spilling it all on social media is not a good idea! Posting private details about the breakup publicly can easily have negative repercussions. So, encourage your teen to leave the matter off social media channels, at least until they allowed themselves to work through their feelings and found some emotional balance. In order to help your teen find this balance and handle the breakup with maturity, you need to validate their emotions. Just because you may have felt that the relationship wouldn’t last from the start, doesn’t mean you should voice that opinion or tell them the breakup isn’t really a big deal. Rather, show empathy and compassion and tell your teen that you understand their sadness and difficulty getting over the breakup. Instead, help your teen to see that they won’t feel like this forever and encourage them to go through the grieving process. That’s what will help them heal, not trying to escape from painful feelings. If your teen was the one who initiated the breakup, respect their choice. Don’t try to talk them out of it or suggest they made the wrong decision. Even if it could be a mistake—it’s your teen’s mistake to make! No matter how it happened, they’ll still be upset and need you to stand by their side. After the initial shock and pain wear off a little bit, ease your teen back into a regular daily routine. Without being pushy, direct their attention to matters of everyday life, including sports practices, homework, or even chores. Kindly help them to see that life needs to go on. And there’s nothing wrong with adding some fun distractions now and then. Think about some of the things your teen likes doing—going to a sports game, shopping, seeing a movie—and plan them into your schedule. It doesn’t have to be a big outing, just something to help your teen see that life, in general, is actually pretty good. Don’t fool yourself into thinking that, once the initial days of sadness and anger are over, it’s all over and done. Yes, your teen will probably be calmer. But that may only last for a time until they have a bad day. So, be prepared for their mood to rise and fall like ocean waves for a while. Just learn to ride them out together. However, if your teen is showing signs of depression, if they’re developing sleeping issues, or if eating problems become apparent, don’t hesitate to seek out professional help. 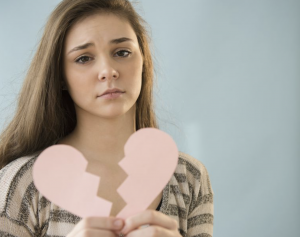 Sometimes teens need more help with getting over a breakup than parents can provide. There’s no shame in asking for assistance. No matter what gender, teens can go through various emotions after a breakup. Depending on their personality, they may deal with those feelings easily or have a very hard time getting over the loss. As their parent, you can help by being there for them during this difficult situation and trying your best to apply the aforementioned suggestions.